How long will the good times last? Lest the headline surprise some readers I must clarify that I am referring to the US, not India. "This is the kind of economy that central bankers dream about. "No, really, they had to dream about it. That's because, other than the late 1990s, we've never seen the confluence of so much positive economic news like we are now. Unemployment, after all, has just fallen to an almost-50-year low of 3.7 percent, and wages are still rising at a more respectable rate of 2.8 percent -- but despite all that, prices have only gone up a restrained 2.3 percent the past year." In response to the good news, the Fed raised its benchmark interest rate in September 2018 and hinted at one more this year and three in 2019. How long will these good times last? The figure below shows the growth rate of Corrected Money Supply (CMS, my measure) since 1961. A month ago the US Bureau of Economic Analysis radically reworked data for a host of measures such as personal consumption expenditure and the personal saving rate. The chart for CMS growth uses the new data. 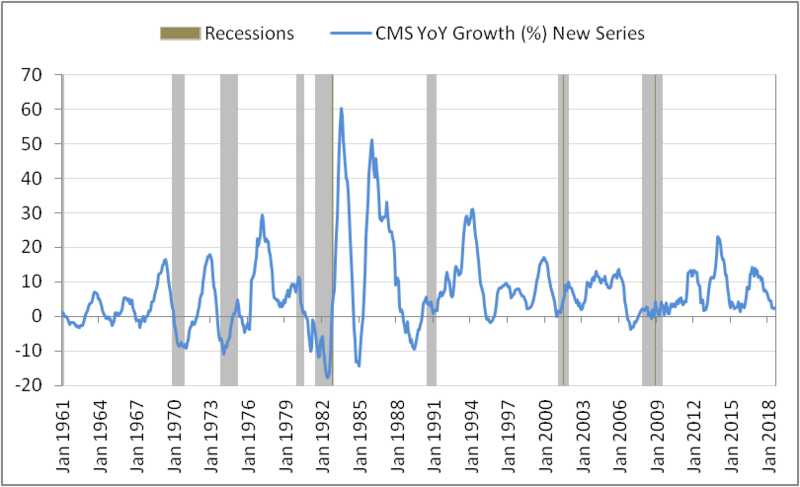 As can be seen, whenever CMS growth falls to zero, it is usually the cue for a crash in one or more asset markets and a coming recession or mini-recession. In 2015, when CMS growth came close to zero and stayed there for some time there was a mini recession. After that, the CMS growth rate again rose much above 10%. Since the beginning of 2017, however, CMS growth has been falling steadily and it is now hovering around 2.5% (the figure is for August 1, 2018). The rate hike in September has probably pushed the growth rate of money supply further down. At the moment, one can safely say that the Fed's plan for three more rate hikes in 2019 will not materialise. The US economy will go into a tailspin much before that.